The foundation of understanding our passage is the Baptism of the Holy Spirit. At that baptism the Old Man, everything we were before salvation, is crucified with Christ. He’s dead. We never have to kill him again. In his place we have been given a New Nature with new options. We don’t need to slap our New Nature awake periodically, but we do need to learn how to volitionally tap into the new life which is already ours. Sin did not die, but its power to rule is destroyed. This means we still must deal with sin, but the options we are given in our New Nature give us the power to do that through fellowship in confession and growth in our new Nature. Learn how the grammar of the passage clarifies any question regarding imperatives necessary to apply in our new lives and ones that are no longer an issue. For the believer, the sin nature’s authority is a dead thing. To keep relying on him for orders and expecting victorious results is like jumping on the chest of a dead man. It’s futile, even a little disgusting. Our assignment is to climb out of the rut of old habits and focus on the mindset that we are completely new, completely different. When the opportunity arises to exercise our volition, relying on truth as its source, we begin building a new path above the familiar trench of muck and decay into the reality of the capacity for life in Christ. As a believer we are not commanded to be justified again. Our command is to be sanctified, an ongoing process of living the spiritual life, a result of our identification with Christ in the newness of His resurrection and a unique privilege for the church age believer. Our challenge is to put into practice the reality we possess at salvation. Paul is laying the foundation for the spiritual life which begins with KNOWING what has already been accomplished. The provision we possess as believers is the freedom NOT to sin, not the freedom TO sin. We’ve always had the freedom TO sin. An irreversible break from our old nature has occurred and we are forever different. Sin is not dead but our proclivity to be comfortable in it is not the same. Reality is that we are slaves to righteousness, but free to respond to the master we choose, sin or righteousness. See how being under grace removes the mandate of law and gives us a freedom that wasn’t there for Old Testament believers. 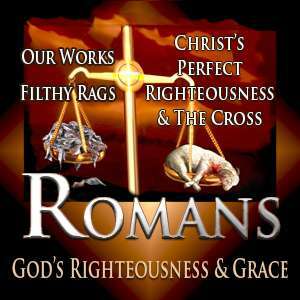 God’s righteousness gives life. Learn the about the life experiential righteousness can give. Note that the class number (#78) on the video is incorrect. Our presuppositions are ideas accepted as truth which shape our thoughts and actions. They may have been developed within a cultural framework and will need relentless scrutiny through the absolute Truth of scripture in order for us to maintain objectivity. See why we can presuppose that when Paul is talking about the Law he is talking about the Mosaic Law. Understand the reason the Law was given and how the Jews came under a new authority at the beginning of this age of Grace. Paul illustrates this transition out of the old authority in a teaching tool taken from an analogy related to death in marriage. See how death separates us from the authority of the one who has died, whether it is sin, a husband or Law, and how following the mandates of our new authority is a result of our new life in Christ. The transition from being under Law to being under Grace is best understood within a dispensational framework. What is the role of the Law in the Church Age? What was the role of the Law before the Church Age? The Jews valued the Law as a path to righteousness before God. It was never meant to be a means to personal holiness, but the bright light that exposed our unattainable need for righteousness. The value of the Law is never diminished in scripture. It is elevated as God’s creation, wondrous, perfect, pure, exalted. Though accused, Paul never taught contrary to a high view of the Law. The Law was temporary but sufficient to teach until maturity came through its fulfillment in Christ. The Holy Spirit is an even greater provision from God, a means to address sanctification in the most intimate and powerful level of relationship with Him made possible by means of the completed work of His Son. As a result of Pastor Dean’s leadership participation in The Dispensational Hermeneutics Study Group, he read and commented on Martin Luther’s timeless quote about the importance of knowing scripture’s original languages in preparation for pastors to teach the Word of God. In our passages we confront a dispensational shift, a change in the way God relates to us, from Law to Grace. The Law failed because it could not make man righteous. Because the Law was fulfilled in Christ, a new relationship was born that transcended all the Law was meant to do. While moral tenets of the Law are not thrown out, we now follow our mandates and live our lives by faith, not by legalism. Our focus becomes spiritual growth, and the only way to accomplish that is through the Holy Spirit given by Grace instead of works of the Law accomplished through one’s own effort. As Gentiles, what is our inheritance? The promises belong to Israel. How do we get them? In all ages, how is man justified? Could life have ever come through the Law? In comparison to the Church Age, the Law provided little for the believer’s spiritual life. The Law was temporary, given by God so man could understand his impossible position of death. In the Church Age, the power of the sin nature is broken and the Holy Spirit indwells the believer, but even more is in store for the believer under the New Covenant, which is made with the house of Israel and the house of Judah but through which Church Age believers benefit. Through the Holy Spirit, New Testament teachers have resources to be ministers of the gospel. They can announce God’s plan for the New Covenant which may have similarities to today, but is enacted in the future with Israel. Learn about the New Covenant, permanent and eternal, introduced in the Old Testament, prior to the Church as a part of Israel’s future and her worldwide blessing to all nations. With regard to the election; evil succeeds because good men do nothing. God’s permissive will is not necessarily His desire. Christians fail when, like the pagan, they fail to show up to learn God’s Word and aren’t courageous enough to be leaders in the counter culture of God. Contrast the glory of the Law, though it is insufficient, with the more glorious sufficiency of the Spirit which equips us to be ministers of the New Covenant. It has been thought there were two New Covenants, one of them with the Church. But the New Covenant is with the House of Israel and the House of Judah. The Church’s participation comes not on the human side, but on the divine side because of our identification with Christ. See how the New Covenant is yet to be fulfilled but blesses the Church who has a role, through the Holy Spirit, as ministers of this covenant. Learn the elements of conditionality and unconditionality in covenants and why more appropriate words, permanent and temporary, may be applied. Follow the future history of Israel’s restoration, God’s faithfulness in fulfilling His covenants and the differences in spiritual life as God’s ages in history are fulfilled.